Suffering from chronic pain can be debilitating and can keep you from leading a normal life. Chronic pain can come in the form of arthritis, headaches, neck and back pain, and even TMJ. Many times doctors will recommend pain killers and may even prescribe stronger than over-the-counter medication to help manage pain. If you are looking for an alternative to taking medication to ease your chronic pain, consider a consultation with St Paul MN Caron Chiropractic Clinic, P.A..
Back aches? Neck aches? Sports Injury? Painful knots in your shoulders? Day to day pain like these can be exhausting and even hinder you from fully enjoying life. While it might be tempting to take a pain reliever for some of these aches and pains, there is an alternative to finding relief. Massage therapy is a great way to relax and unwind, as well as to find relief from the everyday aches and pains. 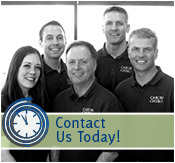 The massage therapists at Caron Chiropractic Clinic, P.A. of North Oaks MN are ready to assess your pain and treat your ailments with therapeutic massage. Benefits of Acupuncture Therapy have baffled medical experts for years. There have been numerous studies done to determine how this Ancient Chinese Medicine works to manage pain, anxiety and inflammation. While experts may not agree on the Benefits of Acupuncture or how Acupuncture Treatments work they are generally in agreement that something is going on. Inside of the body there is a reaction when tiny acupuncture needles are inserted at precise areas of the skin. Patients at Caron Chiropractic Clinic in St. Paul, MN can utilize Acupuncture Therapy for relief of Back, Neck, Arthritis, Carpal Tunnel and other conditions. Dealing with a sports injury can be a nightmare. These injuries often keep us from doing what we love most – playing sports. If you’re struggling to recover from a recent sport injury, chiropractic care may be a way for you to reduce the pain from your injury and get yourself back to playing the sport you love sooner rather than later. Caron Chiropractic Clinic of St. Paul, MN offers adjustments as well as cold laser therapy and other sports injury help to reduce the discomfort that many of our patients experience while playing sports.